B.A., Oberlin College, 1980. 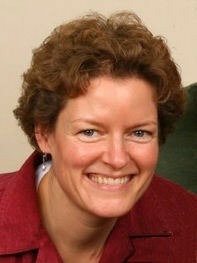 Ph.D., Cornell University, 1984 (M.J. Sienko). Honors and Awards: Oberlin College Holmes Award for Research, 1980; DuPont Teaching Award, 1982. At Oregon since 1986. Research in the Page laboratory is focused on developing novel, sustainable synthetic routes to solid-state materials that have relevance to developing technologies. An integral component of our work is the emphasis that we place on using a broad array of characterization techniques to evaluate the structure and properties of the materials we make in order to derive correlations between the synthetic route, structure and composition, and physical properties, and using these correlations to optimize synthetic parameters and resulting properties. Current research focuses on aqueous routes to metal oxide thin films with a range of properties and potential applications, from ionic conductivity to ferromagnetism. Of particular recent interest, the group has been working on developing low-temperature aqueous routes to high quality amorphous dielectric insulators for the next generation of electronic devices. As a member of the Center for Sustainable Materials Chemistry (CSMC), the Page group works with over twenty research groups across the country to expand the application of green routes to technologically relevant materials. Students and post-docs in the Page lab work on all aspects of materials synthesis, ranging from preparation of bulk solids and gels to thin films, and characterization using XRD, XRR, SEM, EPMA, XPS and ToF-SIMS. In addition, there are multiple opportunities to work with collaborators to learn specialized techniques, such as solid-state NMR, pair-distribution function analysis (PDF), electrical device fabrication, and magnetic measurements. Students will enjoy personalized attention in our small, tight-knit group while also benefitting from the collaborative nature of the larger CSMC community. Aqueous routes to metal oxide thin films. The general process employed for aqueous solution deposition involves spin-casting homogeneous solutions of metal salts or clusters onto a flat substrate to form a thin film, then annealing the film to remove water and counterions and to promote cross-linking (condensation) to form a continuous metal oxide network, as illustrated in the cartoon below. 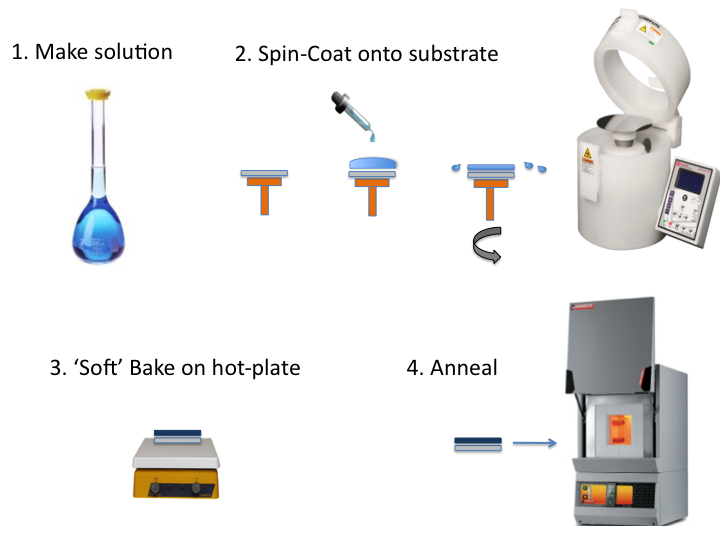 1) Development of this technique to produce high quality metal oxide thin films at relatively low temperatures for a range of applications, ranging from dielectric gate oxide films to ferroelectric films. 2) Developing a detailed understanding of the chemistry involved in film formation and densification. 3) Developing the use of new and known powerful analytical tools for studying the structural evolution of amorphous films to inform studies of the film formation chemistry. Please see Page Lab web site (link above) for more details. Norelli, K. M.; Plassmeyer, P. N.; Woods, K. N.; Glassy, B. A.; Knutson, C. C.; Beekman, M.; Page, C. J. Influence of composition and processing parameters on the properties of solution-processed aluminum phosphate oxide (AlPO) thin films. Solid State Sciences 2016, 55, 8-12, available online February 2, 2016, DOI:10.1016/j.solidstatesciences.2016.01.009. Fairley, K. C.; Merrill, D. R.; Woods, K. N.; Ditto, J.; Xu, C.; Oleksak, R. P.; Gustafsson, T.; Johnson, D. W.; Garfunkel, E. L.; Herman, G. S.; Johnson, D. C.; Page, C. J. “Non-uniform Composition Profiles in Inorganic Thin Films from Aqueous Solutions.” ACS Appl. Mater. Interfaces 2016, 8, 667-672. DOI: 10.1021/acsami.5b09692. Plassmeyer, P. N.; Archila, K.; Wager, J. F.; Page, C. J. Lanthanum Aluminum Oxide Thin-Film Dielectrics from Aqueous Solution. ACS Appl. Mater. Interfaces 2015, 7, 1678-1684. Wiedle, R. A.; Warner, M.; Tate, J.; Plassmeyer, P. N.; Page, C. J. Thermal conductivity of amorphous thin-film Al-P-O on Silicon. Thin Solid Films 2013, 548, 225-229. Dickson, D. J.; Lassetter, B.; Glassy, B.; Page, C. J.; Yokochi, A. F. T.; Ely, R. L. Diffusion of dissolved ions from wet silica sol-gel monoliths: Implications for biological encapsulation. Colloids Surf. B: Biointerfaces 2013, 102, 611-619. Dickson, D. J.; Page, C. J.; Ely, R. L. Photobiological hydrogen production from Synechocystis sp. PCC 6803 encapsulated in silica sol-gel. Int. J. Hydrogen Energy 2009, 34, 204-215. Neff, G. A.; Helfrich, M. R.; Clifton, M. C.; Page, C. J. Layer-by-layer growth of acentric multilayers of Zr and azobenzene bis(phosphonate)​: Structure, composition, and second-​order nonlinear optical properties. Chem. Mater. 2000, 12, 2363-2371. Ansell, M. A.; Cogan, E. B.; Page, C. J. Coordinate covalent cobalt-​diisocyanide multilayer thin films grown one molecular layer at a time. Langmuir 2000, 16, 1172-1179. Ansell, M. A.; Cogan, E. B.; Neff, G. A.; Von Roeschlaub, R.; Page, C. J. Self-​assembly of thin film superstructures based on alternating metal-​bisphosphonate and cobalt-​diisocyanide layers. Supramol. Sci. 1997, 4, 21-26. Neff, G. A.; Page, C. J.; Meintjes, E.; Tsuda, T.; Pilgrim, W.-C.; Roberts, N.; Warren, W. W., Jr. Hydrolysis of surface-​bound phosphonate esters for the self-​assembly of multilayer films: use of solid state magic angle spinning 31P NMR as a probe of reactions on surfaces. Langmuir 1996, 12, 238-242. Ansell, M. A.; Zeppenfeld, A. C.; Yoshimoto, K.; Cogan, E. B.; Page, C. J. Self-assembled cobalt-diisocyanobenzene multilayer thin films. Chem. Mater. 1996, 8(3), 591. Houk, C. S.; Burgoine, G. A.; Page, C. J. Application of energy-​dispersive x-​ray elemental mapping to probe the homogeneity of sol-​gel derived YBa2Cu3O7-​δ and related phases. Chem. Mater. 1995, 7, 649-659. O'Brien, T.; Zeppenfeld, A. C.; Richmond, G. L.; Page, C. J. FTIR studies of hafnium-a,w-alkylbisphosphonate multilayers on gold: effects of bisphosphonate chain length, substrate roughness and functionalization on film structure and order. Langmuir 1994, 10, 4657-4663. Zeppenfeld, A. C.; Fiddler, S. L.; Ham, W. K.; Klopfenstein, B. J.; Page, C. J. Variation of layer spacing in self-assembled hafnium 1,10 decanediylbis(phosphonate) multilayers as determined by ellipsometry and grazing angle x-ray diffraction" J. Am. Chem. Soc. 1994, 116, 9158-9165.